My brackets are doing pretty well. Maybe not fantastic like win a trip to the final 4, but good enough to stay ahead of A in our big home challenge. Glad UConn pulled off the win against Maryland, but gosh, I hope all the injuries heal fast and well. They looked a little beat up. And what were the refs thinking int eh first half? Really? Are they blind? But not too excited to knit – I am almost done with the first ultra long leg warmer, and will cast the second on tonight, I think. I hope C likes them – they are going to be quite warm – too warm for summer 🙂 but good for next year. Yesterday I did get to the Craft Barn in Ellsworth after taxes, and was able to pick out some soft acrylic yarn for a baby blanket. It has been a while since I worked with that kind of yarn, not sure how I will like it, but I know it is practical for a new baby to have really washable things. I’ll work on that over the next few months, A’s co-worker will is due in July, and I will be crocheting – much faster to get done! I hope to also knit a pair of little booties using a;s mother’s favorite pattern. She was well-known for knitting the booties, and we try to give all new babies we know a pair of them. Today between games I got into the craft room and worked on what were the Easter cards, but due to a lack of time on my part, are now the “welcome spring” cards. Sigh. Just not enough time in the week to get everything done. Really? Why did he think I was sitting there? Believe me, a barber shop is not such a wonderful place that people go there to just hang on Saturday morning. I honestly think that he somehow figured I was there with the kid, but as the kid was gone, I am not sure why he thought I was still there. But clearly, he did not think that a woman should get a haircut at a barber shop. I would not have been surprised if this guy was old, but if he was 35 I would be astounded. So it got me wondering when this world will ever get over having such strong stereotypes? Stop making judgements about things based on them? Please don’t say never. Tomorrow is Friday – another tax day – means a dull list for you guys. The taxes are in SW Harbor again, so I should get home at a decent hour. A has asked me to get supper at Pat’s Pizza in Ellsworth on my way home. She gave me a huge list of appetizers to last her all weekend. Not sure yet what I will get. But it is clear, we won’t be cooking over the next few days. That’s it – except that I have to stop into the office to sign the time sheets, since I wasn’t there today to do it. Hope I don;t get caught as I have to meet my tax partner at 8:15. I have to say that this week is lasting forever. I can’t believe it isn’t over yet. Monday I worked from 7 am until 10 pm. (meeting in Calais in the evening) Tuesday was from 8:30 am to 8:30 PM. Wednesday was from 7:30 am until 8 pm. Today was short – 7 am until 4:30 PM. By the time tomorrow is over, I think I will be close to 60 hours. No wonder I am exhausted. Just waiting for the week that is a more reasonable number of hours, and includes a Friday off! I think that will be the week after next…. I can’t wait. And Saturday, I don’t care who needs what done, I don’t plan to get up early, even if I wake up at 4:30 like every other morning. Busy day! A and I slept late, both exhausted from a long work week, and then we thought we had loads of time to get a few chores done before we headed to Bangor to meet up with her sisters and nieces for a birthday lunch for niece T. We leisurely got ready, headed out to things like the PO and grocery store. Got home and the phone was ringing. Total change of plans – niece J (flying in from PA) was getting a later flight, so lunch would happen earlier, and without her. We scrambled to wrap presents and get out the door again. Made it to Governor’s in Orono in time – whew! 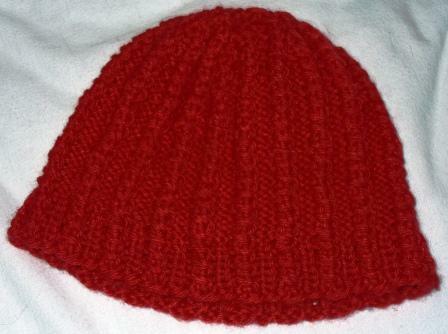 Through all of this driving, I was knitting around and around on this cable ribbed hat I made up. It did not come out like I planned (do they ever?) but I think it came out cute, and it fits better than I thought it would. Even as I was finishing it up, I was thinking about ripping it out and making a plain hat. But I like it, and if it fits me, it will fit someone else, so in the bag it goes! Once home, it was BASKETBALL! Women’s tournaments started today, we have our brackets done,a nd our friendly little wager in place. We actually have two – one for the whole bracket best score, for cash for the stash. The other is just the final 4, once we get that far (gives us a chance to revise in case our original 4 aren’t actually there!) for a weekend breakfast. This is very exciting time of year for us – A gets to watch lots of good women’s basketball, I get to root for UConn and knit. I am about half way through one leg warmer – they ARE coming out as I imagined, and I hope niece C likes them! The k2 p2 ribbing for 28 inches is tedious, but at least I have the color changes to look forward to. I don’t think I would do much with them if they were all one color. They should be done long before we crown a national championship winning team. So I put it up there – for $5 I will donate a hat to charity in someone’s name. I figure that this is a way to at least contribute to the yarn fund, right? We will see how it goes. So far no one has looked at the gig. If you want to – check it out at http://fiverr.com/salpal1/donate-a-handmade-hat-to-charity and let me know what you think of the idea. Next step is to learn how to promote the thing, I can’t even find it in random searches and I know it is there. Sigh. Anyone who has ever done this, I would love to hear more about how to make it effective. Author salpal1Posted on March 21, 2013 March 21, 2013 Categories what I am thinking aboutTags fiverr, hats, knitLeave a comment on hats on fiverr!! A foot of new snow over the last 24 hours. Early dismissal yesterday meant driving home in the middle of the storm, but in daylight. Delayed start this morning meant I didn’t have to get up at 4:30 to shovel, but sadly, I didn’t know that until 6:15 as I was finishing. Snow is pretty. This is Maine. Why am I complaining? BECAUSE I AM TIRED OF IT!!! I want to start my seeds and have things growing and warm sunshine and swim in my pool. So. The good part of it? A also got out early yesterday, so we were able to sit in front of our fire yesterday, she reading, me knitting on the blue leg warmers. I had time to make some good chili for supper. But that’s all I can think of. Really. And I even have Allie here helping me type, she can’t think of anything, either. Can’t remember if I told you A and I are doing our own little biggest loser, because I am not participating in her office one this time around. Well, she has been beating me soundly (and winning at work as well!) I am really proud of her, but still, I want to win. We have $10 bucks a week on this! Today I finally lost weight and won the week! I had been wondering why I wasn’t losing, and suddenly I lost over 2 pounds,so I guess my body just wasn’t ready to part with it until now. Since I was the big winner, I took the opportunity to go online after work and order a new bathing suit for summer (since I am pretty sure mine from last summer won’t be able to be worn in public….) and I hit a sale at Land’s End – 20% off swimsuits and free shipping on orders over $50 (and even on sale, suits cost more than that) so I saved over $30 total. Can’t beat it. Also, had to buy a swim suit to counteract the evil snow storm coming our way tomorrow. Really. Another storm. All this mild weather and melted snow was just a teaser, I guess. It’s depressing. Unless I get a day off work – !